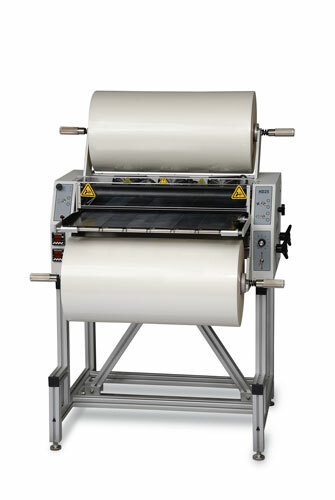 Dependable "Workhorse" Laminator - 25"
25 inch width. Industry testimonials prove this to be the most dependable, versatile, productive, trouble-free, easy to use and friendly laminator. These are the terms Ledco owners use in describing the Work Horse laminators. Who can use a Workhorse? Any graphics or finishing shop that needs a true commercial machine ... trade laminators, photo finishers, printers, government or school support centers, binders and finishers, military installations, hospitals, reprographers, map makers, publishers and manufacturers. Laminating Roller Diameter 1 1/2"
Maximum Film Roll Diameter 12"
Weight / Shipping Weight 285 lbs. / 560 lbs. Low melt laminating films is the primary choice for most laminating jobs. With a 40 to 50 degree lower activation temperature they can be used with most ink jet, lithographed, silk screened, photo-graphic, electrostatic or other reproduction methods. Prices also includes, upper fan assembly, 2 roll stop collars and extensions to accommodate 12" OD roll of film.